I am deeply hurt because I do not understand why you have put after your post. 3 HMs, 9 HMs, 14 HMs, 20 HMs or more … I shall be extremely proud of us, whatever we do … And you better be as well. 2 more than me - but then again, I'm only joining in after the 25th so will likely only manage 10 or so. Plummy, 10 or so ‘ aint half bad ‘. From the virtual sidelines ( because that’s where the sensible people stand ) lots and lots of virtual cheers to everyone. Wow, Steven did 2 HMs a day for the last 6 days!!! A real Crazy bear! Can only agree with Jill. Stay safe and injury free everybody! I second (or third) Jill and Tako’s wishes! Lots of respect for anyone starting this challenge! Just finished #5 with a SB of 1:26:26 and am pretty satisfied. Jill, I apologise for any unintended offence, reading it again it seems very arrogant. It serves me right that I have not managed any since. Alan I am so sorry for unintentionally hurting your feelings - my post wasn’t meant to sound arrogant, it was a genuine attempt to cheer you up and make you feel good about yourself. I know that there have been occasions when my childish sense of humour gets out of hand and spills out on to the forum - and when it does, it's just me being a twit and wanting to make you all laugh, but never at someone else's expense. It mortifies me to think that I might have inadvertently hurt anyone's feelings and I apologise if I have done so. Alan, the last part of my original post did, and still does, include you. This next bit comes with a ‘ silly warning ‘. It’s only fitting that I award myself the title of chief Noodle. However, the position of deputy chief Noodle must go to you for calling yourself arrogant. Back in ‘ sensible mode ‘ now. Thank you Alan. In case you are, ( for whatever reasons ) feeling down about your rowing abilities and motivation at the moment, you will always be a kind and funny, supportive and modest, ( there is no such thing as a Full of Themselves Free Spirit ) respected and valued member of this club. Last edited by Jill on Sun Nov 26, 2017 6:26 pm, edited 1 time in total. 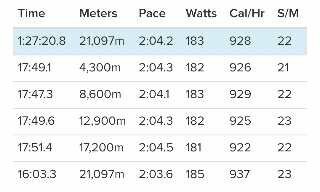 WIRC out of the way and migraine more or less tuck away (a little bit of residual headache still lurking) I had time to get back on the Crazy Bear horse this morning and knocked out #3 in 1:29:26.7 - not spectacular but my legs were still feeling tired from yesterday's race. Happy to get back on the metre munching. Good to have you on board again. Did #13 this morning with a SB at 1:25:13, very pleased. I also suffer from migranes. I remember the times before triptan was invented. At least nowadays triptan takes away most of the pain. I have been struggling with my rowing most of this year however I will return-did a Wolverine Plan session yesterday 8 x 500 which did not kill me so will look to build and will also try a few more HMs before the end of the challenge. 2 nights ago I created a new spreadsheet for the Crazy Bear himself - who freely admitted he's been so busy at work he's barely been able to think about setting it up. He said he's had numerous requests about it so I think it WILL be happening but might be a bit last minute. I've changed it this year so you can do erg HM, ski-erg HM (counts as "1") or a bike-erg FM (counts as "1") to reflect the different equipment types. I'm awaiting him creating a new FB page or re-using last year's - not sure which way he'll go as it's his baby really. Good luck to everyone planning to take part in this year’s challenge. If your goal is to complete the 30 HMs or it’s more of a ‘ let’s see how it goes ‘ approach, then either way, take care of yourselves. Your posting with the link has disappeared. When it was there yesterday I was not able to edit the sheet. First I had to log into my google account and then I was prompted to ask the creator of the sheet for permission. I've got the first 2 done, times are very slow (my PB is only a 1:31:55 anyway) as digging and laying path at the weekend and previous 2 weekends has really hurt my back problem. So I am just going steady at the moment so I can at least keep ticking them off. As long as my back doesn't get to bad I hope to gradually keep bringing the times down every row finishing with a PB. The main thing for me is I want to complete it. Jürgen and Swinny, you are really steaming forward! Not sure whether I should call it impressive or crazy! I go for the first and hope your body takes it well and without injuries! Also to all others doing the challenge! Mr. Dowd on the other side is a Crazy bear with 2-3 HM each day. It is a shame that he does not clock those meters for FreeSpirits anymore. I have only done 4 HM so far and do not plan to register in the sheet, but use them for the holiday challenge instead. Happy and injury-free rowing to all crazy rowers! Tako, how many do you intend to do? Like you say, its great for the holiday challenge. Thanks guys. Yep, this is brutal. I think, I read somewhere, that most of the meters of Mr. Dowd are not rowed but on a bike. But not sure where I read it.